This away shirt was used by Liverpool in season 1993-1994 and 1994-1995. This away shirt is characterised by three slanted parallel white stripes on each side in front which leads to the nick-name of "ribs" shirt. There are no long sleeved replicas produced for this shirt. 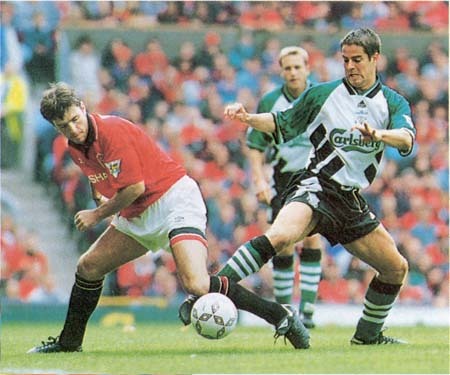 Featured Jamie Redknapp wearing the 1993-1995 away player shirt with big Carlsberg sposnor. 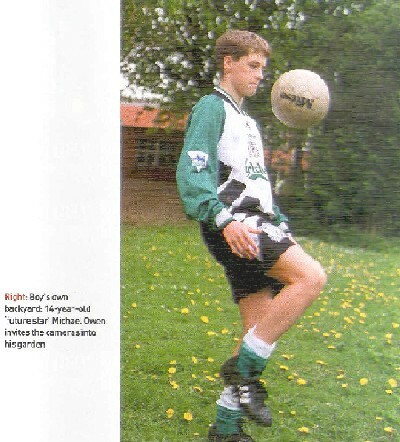 Featured rookie Michael Owen wearing the 1993-1995 away player shirt with small Carlsberg sponsor. 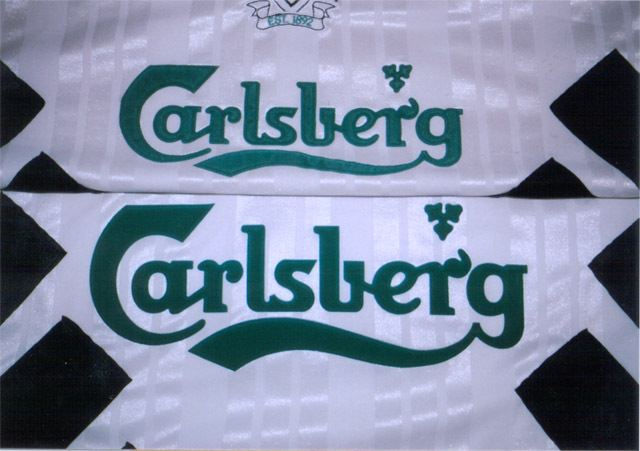 A big Carlsberg version away player shirt has a larger size Carlsberg sponsor logo when placed inline with the replica shirt. As seen above, the upper shirt is a standard official replica shirt and the bottom sihrt is the big Carlsberg version away player shirt. 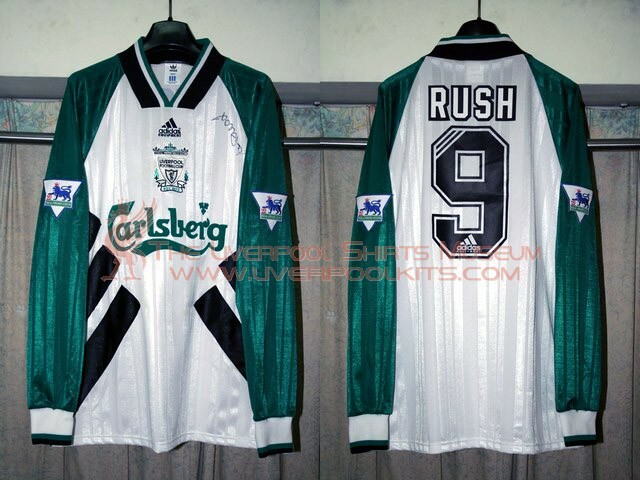 1993-1995 Liverpool Away Player Shirt - Number 9 shirt belongs to Ian Rush. Note this is the big Carlsberg sponsor version. A standard away replica shirt has rubber embossed Adidas motif and club crest. A genuine away player shirt (small Carlsberg version) has embroidered Adidas motif and club crest. 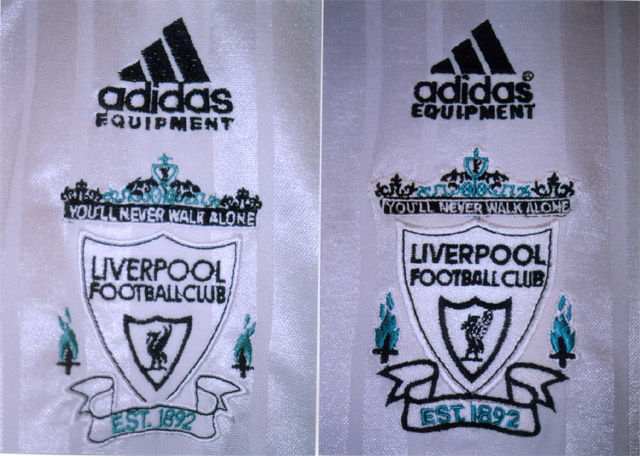 Note there is a circled-R (copyright registered mark) next to the words Adidas Equipment on the big Carslberg version player shirt. 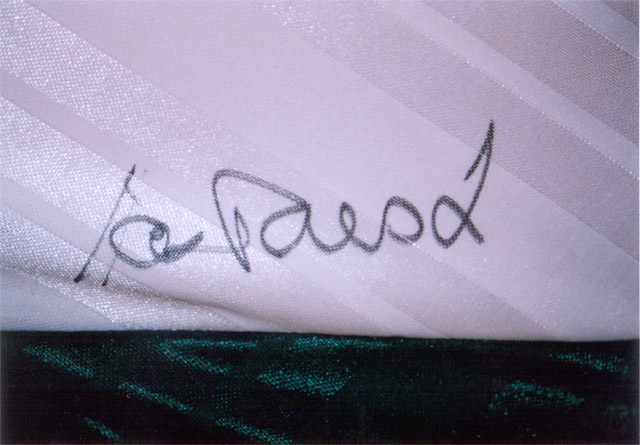 This Ian Rush away player shirt was autographed by Ian Rush in the front side.